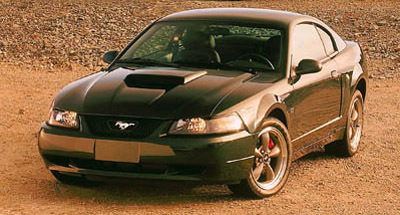 The rebirth of the 2001 Ford Mustang Bullitt began as an idea for a concept car for the SEMA show in Las Vegas. 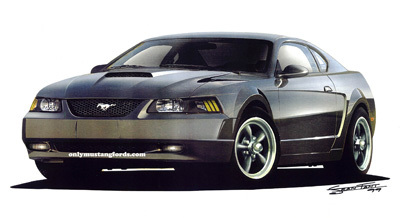 Sean Tant, at Ford's Team Mustang department, was given a project to come up with an updated Mustang concept car that could be shown in 2000, that could be built upon some clay design work that had been originally slated to be seen on the 2002 Mustang. 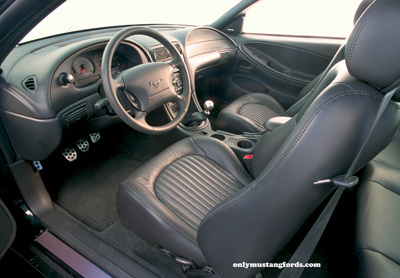 Rather than just be a mimic of an older Classic pony car or muscle car, it had to be a recreation of a Mustang that was instantly recognizable to gear heads and car culture enthusiasts. The winning idea, was an updated version of the green 1968 Ford Mustang Bullitt GT390 in the Steve McQueen movie, Bullitt. And who better to put together the updated concept car for the movie legend for than Jack Roush ? To make the design work on the show car, it had to first be de-chromed like the original, removing unnecessary trim, logos etc. To the basic design, was added a distinct wide hood scoop, modified and widened look-alike torque thrust wheels, just like the original. Making sure you had the stopping power to match the looks, were some cool looking and well performing, bright red Brembo calipers complete with pony logo. And the car's body was painted a mute green paint job, that looked similar to the original car's dark Hyland Green. And if you felt a little less loyal to the original color, you could also order one in Black. Where the GT had fog lights, the Bullitt had a blacked out version, with only a visible pony logo. 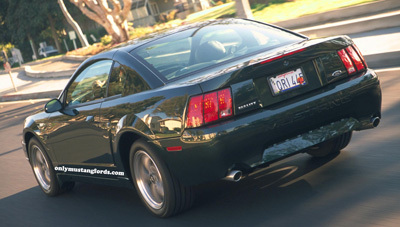 At the rear, the standard GT spoiler was removed and a special "Bullitt" logo was placed near the driver side tail lights. Simple chromed exhaust tips capped off the treatment. Also added, was a billet gas cap, mounted on the rear quarter panel, replacing the standard sheet metal gas door, found on regular Mustangs. 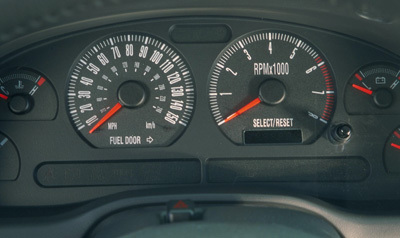 Racing pedals replaced the standard gas, brake and clutch units and the instrument pod showed a 150 mph speedometer, just begging you to try and pin the needle on your 2001 Ford Mustang Bullitt. The base 4.6 liter V8 was bumped up in power to 265 horsepower, which was only 5 hp more than stock, but matched the original Bullit's 265 horsepower 390 cubic inch V8 in power. Even more interesting was the fact that, since the old way of measuring horsepower produced larger sounding gross horsepower numbers, the new 2001 Ford Mustang Bullitt actually had more horsepower at the rear wheels than the original! And that's why in the quarter mile, you'd see the little 281 cubic inch V8 (4.6 liter) small block car, beat the big block 390 V8. While you'll see enough of these cars to know they're around, you won't see many. Total production was only 5,000 units. So if you're lucky enough to own one, you're in select company!